Atlanta's new RV super center! 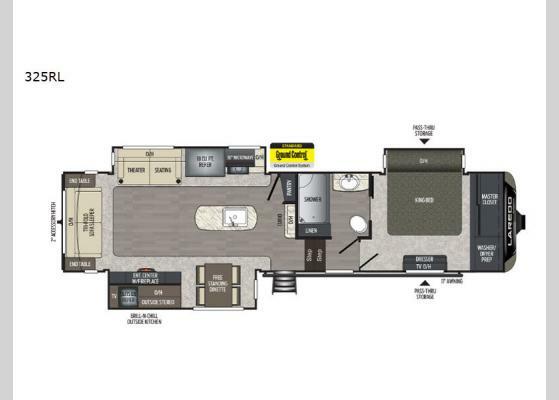 A unit like this Laredo fifth wheel is one that you have to see to believe. You won't be able to ignore the amount of space that the three slides add to the interior for extra treats like the kitchen island and free-standing table with chairs. You will never grow tired of spending your evenings cuddling up on the king-size bed in the private master suite, and if you find yourself craving a midnight snack, you can head to the 18 cubic foot refrigerator to find something to munch on. When you need an RV that won't compromise on functionality, you need a Laredo by Keystone RV, the leaders of affordable luxury. 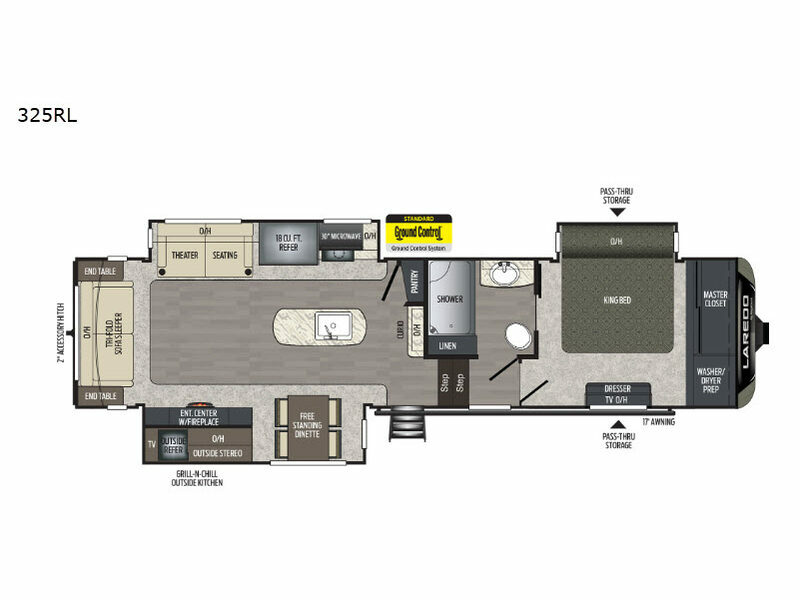 The amenities in your own home are life size, and Keystone believes that they should be that way in your camper too. From the high-rise faucet with pull-out sprayer and residential-grade carpet, to the exclusive KeyTV that provides a multi-source signal control that improves signal quality and television operation, you will be impressed. The 50 AMP power cord and 12 gallon gas/electric water heater will also impress you, and the fully enclosed and heated underbelly as well as the oversized lighted and heated pass-through storage compartment will allow you to enjoy everything about the Laredo during any season of camping. What I liked most: Glass cabinets vs wood, I think they look better. Controls are conveniently located on the wall right when you first walk in. The shower looks larger than similar views I've seen. The bedroom has plenty of storage with a wardrobe closet and that cabinet with 4 drawers in it. It has a long looking island with extra cabinetry. Pantry has a full size door which means it will have a lager storage capacity. Stadium seating couches make a better entertainment experience. Sturdy aluminum steps. 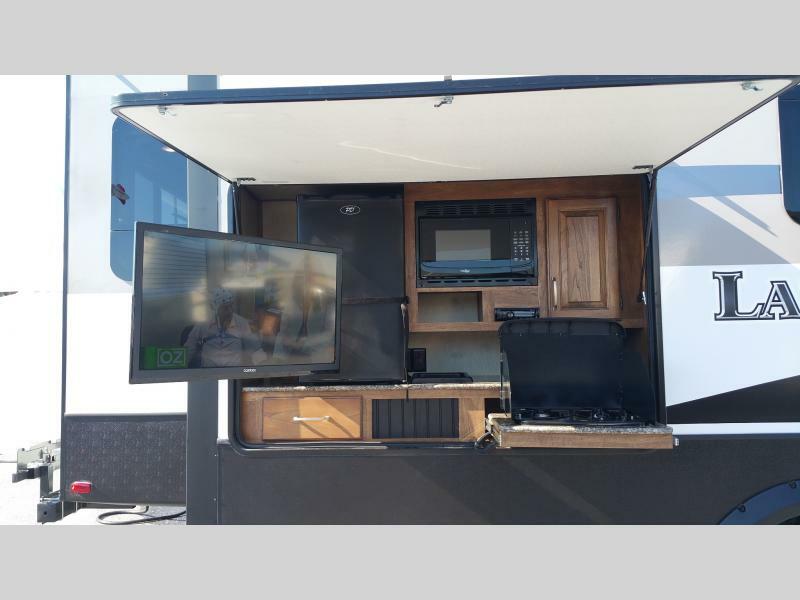 The outdoor kitchen outside is great, it has a swivel pull out tv, a microwave, a stove, fridge, stereo and a cabinet and drawer for storage. What I'd improve: The drawers in the bedroom don't look very good unfinished. The table only can only seat seat 2 and should be set for 4. The outdoor kitchen could use a sink.